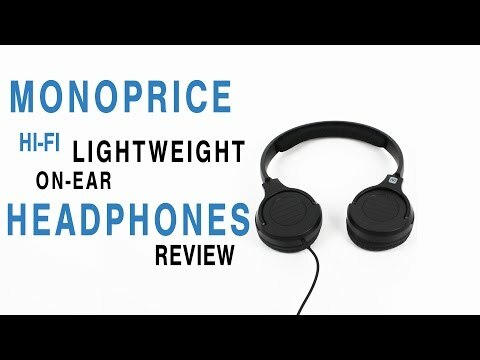 Monoprice has again succeeded in making a quality bang for your buck option with the new Hi-Fi Lightweight On-Ear Headphones. Monoprice has again exceeded expectations and made a quality product for an insanely low price. Monoprice is one of those companies that usually do an amazing job at pumping out bang-for-your-buck products. So when they recently announced three new pairs of headphones we knew that we had to get our hands on one of them. Since we’re fans of their budget options we thought it’d be cool to review the least expensive pair of the three new headphones that were released and see what they have to offer. At only $15 that would be the Hi-Fi Lightweight On-Ear headphones. Not the most unique name but who cares as long as they sound good right? So are they worth the money or are you better off just getting two Pumpkin Spice Lattes? We received the headphones in a white box that I’m fairly certain is not the consumer packaging, so unfortunately there’s no cool unboxing here. At this price point, we really weren’t expecting any kind of premium build materials and we were right. The headphones are made completely of plastic and the padding towards the top of the headphones is nothing special. The ear cups have a similarly cheap padding but they are actually quite comfortable. I’ve been using these headphones everyday for about two weeks now for hours at a time and though they do get a little uncomfortable after 6 or 7 hours, they were insanely smug before that. Besides, I doubt many people will be using them for hours straight anyway, but if you do you might want to loosen up the adjustable ear cups a bit because they do run pretty small. The upside to this is that they have a great seal that completely blocked out “showtime” on my subway rides. Still, even though the ear cups rotate 90 degrees they don’t have any folding hinges so I wouldn’t feel entirely safe stuffing these in a backpack. Then again they’re so inexpensive you can probably just buy another one without a problem. Design-wise these are as basic as you’re going to get: all black with minimal padding. There’s a small Monoprice logo on the right ear cup and the audio cable has a one-button mic/remote that works with both iOS and Android, though with differing levels of functionality (more on that later). Overall, I really liked the design on these. Then again I’m a sucker for a low-key designs, so if you’re more the flashy headphones type these probably aren’t for you. There’s only one way to use these and that’s by plugging them in. They have an audio cable that ends in a 90 degree 3.5mm jack. On that wire is the one button mic and remote. On both Android and iOS clicking once will pause and resume playback, double clicking will skip to the next song, and holding it down will activate Siri or Google Now. On iOS you have the additional option to triple click in order to return to a previous song. These have 36mm drivers which helps make the overall size of the headphones smaller, but that doesn’t make the sound any smaller. Obviously there are better options out there in terms of sound quality, but for the price the Hi-Fi Lightweight on-ears hold their own against headphones that cost 5 or 6 times as much. We did most of the testing on smart phones since it’s doubtful that anyone will be using these for studio purposes, but we did also test them out on a Scarlett 2i2 audio interface just to be safe. We got a good amount of variability in the lows. Most songs (like ‘ROS’ by Mac Miller) had a surprisingly accurate low end that was very easy to follow, but there were a few like ‘This Is How We Walk On The Moon’ by Jose Gonzalez that felt way more loose and a little bit all over the place. Overall the bass isn’t going to rattle your ears, but it’s really good even though a little more consistency would be great. The mids are decent but definitely wouldn’t be considered the strong point of these headphones. Vocals are clear enough but guitars and even some percussion sound like there’s a blanket over them. You can still here them, but they’re not amazingly clear. A perfect example of this is in ‘Alive With the Glory of Love’ by Say Anything where the vocals clearly take precedence over the strumming pattern of the guitar during the verses. It’s not necessarily a bad thing if you prefer vocals but we would’ve liked to see more of a balance. The highs were pulled back significantly which definitely helps with harshness when the volume is maxed out, but there is still some harshness that leaks through. Still, it’s not bad. I was able to hear the guitar slides clearly in ‘Re: Stacks’ by Bon Iver and even what I’m pretty sure was a creak from the chair he was sitting on. That said, other genres like electronic music that use more piercing sounds will most likely cause you to lower the volume in order to escape the harshness. So are they worth it? Absolutely. Sure the sound quality is pretty mediocre for a pair of headphones in the $60 – $80 range, but these are way below that price range. Monoprice found a way to make it seem simple instead of barebones if that makes any sense. Once they’re on your head they don’t feel or sound like $15 headphones even though they might look like it at first glance. Basically if you want good sound for cheap Monoprice has again exceeded expectations. They would also make great gifts for any music lovers you know.